Zero Waste | INFINITY RECYCLING | INC. It boggles the mind, but as we create goals we develop ideals to strive for. 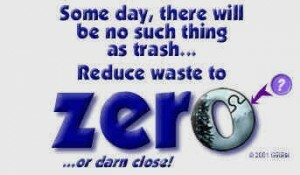 In the world of waste, what better goal to strive for than ZeroWaste. Waste is a sign of inefficiency and short sightedness. With the goal of ZeroWaste, we first eliminate to word “waste” and substitute discards and then we treat these discards as potential resources. We witness the fading of “waste management” and the partake in the emergence of “resource management’. For some it may help to temper the goal by saying “ZeroWaste or darn close”, the goal will not be achieved by recycling alone, nor by all its related practices such as precycling, reducing, reusing and composting. There will have to be breakthrough technologies and breakthrough considerations of producer responsibilities as well as rethinking our rules of subsidies for wasting practices and industries. Did you know?….. that material saved for recycling creates 8 – 10 jobs compared to an equal amount of waste. A ton of newspaper (which is over half of what is collected in household curbside recycling programs) sent to the landfill costs about $50 per ton to collect and transport and about $50 per ton to tip into the landfill. That same ton when processed into newsprint is worth over $1000 per ton. The G.R.R.N. has been involved in two publications; Welfare for Waste, How Federal Taxpayer Subsidies Waste Resources and Discourage Recycling, was produced in 1999 jointly with the Taxpayers for Common Sense, the materials Efficiency Project and the Friends of the Earth. Also released is Wasting and Recycling in the U.S. 2000. It was written and edited by the Institute for Local Self-Reliance with a lot of input from recyclers across the United States. The goal of the report is to counter some of the nay-sayers and rekindle support for recycling and resource conservation.